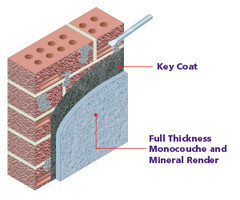 Render coats are applied in successive layers in decreasing thicknesses and strengths. Topcoats, therefore, may be relatively weak. It is difficult to assess the strength of existing materials and their bond strength to previous layers. Additional materials put increasing stresses on the bond interfaces of existing materials. 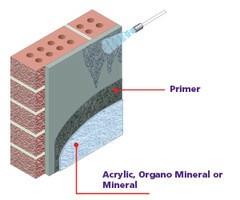 Dirty deposits accumulated over a period of time can form a weak intermediate layer that interferes with the development of the bond of newly applied render. Renders need a combination of mechanical key and suction to bond to the wall. Existing render surfaces even though unpainted or coated are usually “palin face” and seldom have sufficient key to hold a new render. Choose your decorative solution and prepare the substrate accordingly. Providing the existing substrate is sound, well adhered overall its area, not substantially greater than 19 mm in thickness, stronger than the materials to be applied and not painted or coated in any way, power wash dirty areas. Provide a key with all primers solutions or with premixed plasters and apply a finished texture with weberpas and webercal range. If the above criteria cannot be established, remove existing materials. Provide a key with Premix.SRC-1 and apply a full specification thickness render with monocouche weberpral F, weberpral K, webercal Palm.